The most basic problem is how much performance, reliability and consistency of manufacture can you expect from a cheap motor. Racers seem to want cheap (as opposed to relatively inexpensive) motors. Racing puts a lot of strain on any motor but racers seem to prefer these sealed toothbrush/car mirror motors instead of higher quality rebuildable motors. You guys voted with your wallets and the importers have tried real hard to deliver. They do specify many of the things they have found that give us pretty good value but at times you might get a bad batch. When it happens to the motors you are running then it does get a bit irritating. Makes you wonder why there have always been more chassis builders than motor builders. I'm doing alright racing with the Retro East group. I don't care what the motors other applications are. When it comes to the cost of the motor,I have no problem with that. I use rear tires that cost more than my motors and I only get one race out of them. I have more money in my tire program than in my motor program. Like I always say, "Slot car racing is the cheapest form of auto racing on the planet." You ever price a motor for a real race car? So the "weak" brush arms weren't a twisted mass of copper? LOL. I just don't see how they could bend, unless the bushings disintegrated. Falcon 5s used to change speed in bad wrecks, from the comm twisting, either advancing or retarding the timing. I have had a H7 brush arm break off in a crash. Not a result of worn-out brushes. The remaining one was at ~50%. Mabuchi has been putting brushes in the FK 90 degree off style for as long as I have been in R/C. In the '80s and today their 550 motors come this way. Igrashi, on the other hand, had the correct alignment on their R/C motors. Here's another thought about these motors. Did you ever take one of these motors or any motor for that matter and race it around the track and see what times it runs, and then put it on a break in box and run it backwards for a while? Then put it on the track and try it and it is slow as chit? Well, in my opinion, that's how touchy brushes can be to the speed of a motor. When you run the motor backwards it knocks off the nice edge that the brush had on it from rotating in the correct direction and by running it backwards you just changed the brush enough to make your motor slow. Sometimes it takes the motor a while to get back to it's happy spot and sometimes it never will be happy ever again. I took about 10 laps to make sure I got a good lap in. The last one was 4.621. I ran the car backwards on the tester at 6V, for about 5 minutes. I went back on the track and first lap, even with tires a bit cold, 4.66. 2nd or 3rd lap was 4.63. The 5th lap was 4.587. No negative impact at all, and possibly positive. I tried it with a pre-7R brush motor. I tried it a second time, running it for 15 minutes in reverse. Again, the motor was fine afterwards. Possibly you are suffering from TMDB* and are confused. *Too Much Doug Bauer - LOL. My dad tried this and when he ran the motor backwards, it said, "Paul is dead, Paul is dead, Paul is dead." ***All of these type motors have had their brushes oriented this way, and it has never been a problem. It's possible (*but I don't think likely) that orienting these brushes in the traditional way (*with the brush face arcs corresponding to the arc of the commutator) may cause problems that don't normally exist now, most likely because of more overlap. Whatever it is that people see as a current issue may have something to do with harder or inconsistent brushes, and that "kind" of issue DOES come up with normal "replaceable" brushes used in other types of motors...C, D, and minican types. It may well occur in the future in other brands of the same type as the 7R. So, I think that's about it. It would be funny if 7R motors still win some races though! Turning the brushes in these motors around so that they conform to the comm will change the timing and overlap, as John said (like going from a vertical to horizontal brush). Fully seating the brushes in their current configuration will do neither. However, fully seating the brushes does not get rid of the two-speed problem. As in most slot car motors the positive brush will seat first because under normal conditions it wears faster. Since the brushes don't seat equally then spring tension will not be equal. After going through all this I decided to do something new and different. I have a H7 that has one balance mark, fully seated brushes, and still has atwo-speed problem. What I did was something shunned by most racers when it comes to these motors. I oiled the hell out of the wndbell bushing and the can bushing. Current philosophy is to very lightly oil the endbell bushing. Well, "surprise, surprise, surprise," the two-speed is gone and the motor is smooth all the way to 13 volts. See if it works for you. I used the lightest Mobile 1 synthetic motor oil I have and it worked for me. I have been reading a lot of these motor posts. Fascinating thoughts and the brushes and the timing and oiling of the endbell. I have decided to try something different on my motor. 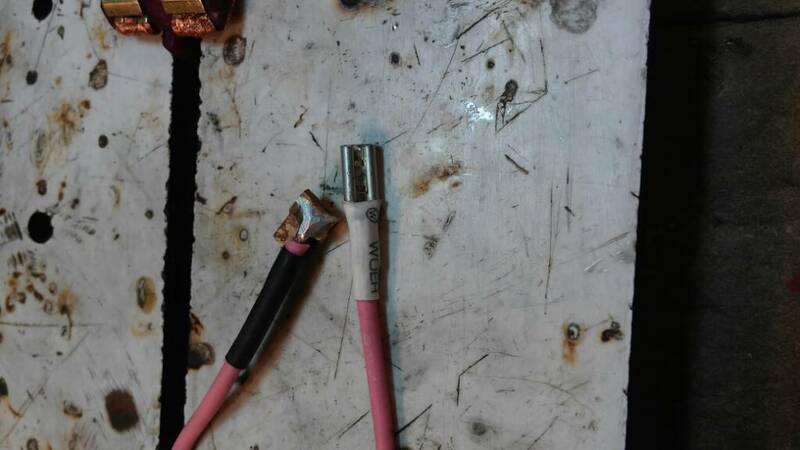 Instead of soldering the leadwire directly to the tabs. 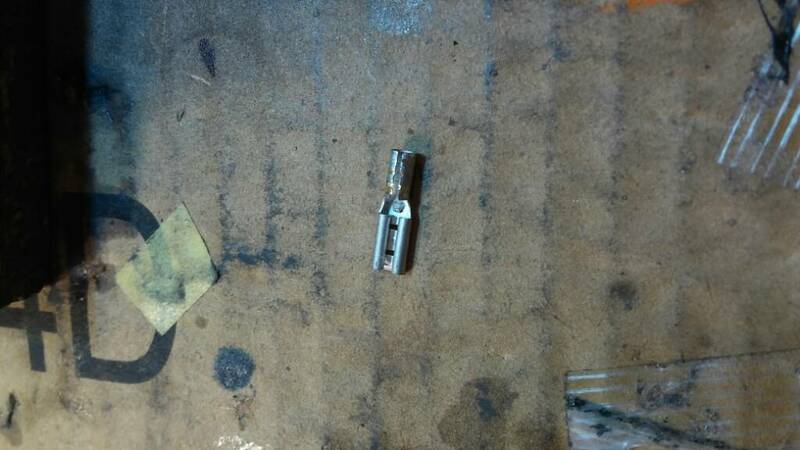 I solder it to a female spade connector. My thought is, the less heat going through that to the brush springs the better. The downside is reason I probably never tried before as you don't want to come loose in the middle of a race. Just make sure you have it nice and tight and they won't come off, I hope. Just tried it this last weekend on my practice car. No problems. To prevent the wires pulling off in a crash or just from racing, put a second wire holder up by the motor. You might be able to safety "pin" them in place also. There should be a hole in the spade, just take a thin piece of wire and wire tie it in place. 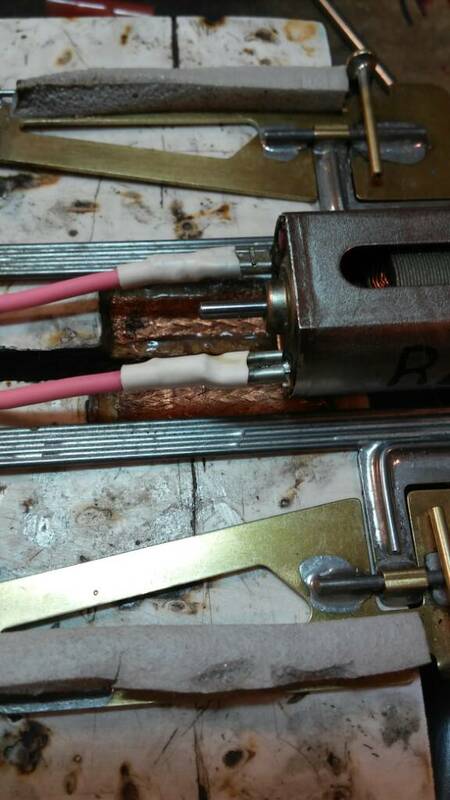 Pinning will only stop the wire falling off. Since the wire is pretty much connected directly to the brush arm and it is only held in place by a small blob of plastic, you also want to stop it from moving around. I know this, when I break the Hawk 7 in with Simple Green for 10 seconds and a quick splash of super hot water, they never have the two-speed issue. We have guys spending 60 bucks to jack up a Hawk 6 and I turn the same times with a 12 dollar motor. Oh, and I always oil the motor before I run it with no issues. I actually had a race-winning F car for 10 months before the motor smoked. I love cheap racing, cheap is the only way to bring new people into this very old and dying hobby. How can you spend 60 bucks on a Hawk 6 without calling Ken O? How much should a skilled builder charge to spend two to four hours on your motor making it as close to perfect as possible?